There will be drinks, food, and great people. This date syncs up with the Blitz! Capitol Hill Art Walk – so if you’re planning on attending the art walk, make Office Nomads a stop for sure! Zahedi's "The Garden of Hope"
Behesht is the Farsi word for Paradise. It refers to a place that is full of happiness, peace, and beauty. In common speech, it also refers to where the soul goes after dying. Humanity is at a fork in the road. Looking at the injustice, war, and escalating ecological calamity in our world, it is easy to become disillusioned and to conclude that we are headed for the latter. I am interested in exploring the possibility of beauty within everything. The works in this series offer a vision of hope for the future of humanity. Directions can change. We can compost the rotting fruits and plant new seeds. We can heal what we have hurt. We can use the very detritus of our blundering to rebuild a society which provides the conditions in which the creative nature of humanity can thrive in safety, peace and beauty. 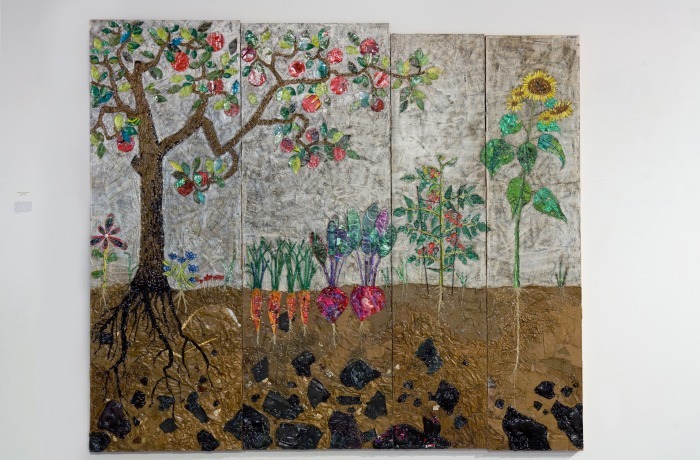 These works are created using trash collected from streets and waste generated at my home. I use these materials because of the powerful symbolism of transforming the trash into something beautiful. I use natural glues, beeswax and a bit of paint to finish the work. The imagery is inspired by the Persian miniatures and carpets I grew up with, 20th century Austrian painting and the textures and processes of nature. I want to capture the feeling and passion of rebirth from the ashes and the joy and exhilaration of creating beauty out of ugliness. Behesht is here; we must only clear away the garbage. This entry was posted on Monday, October 5, 2009 at 2:20 pm and is filed under Artistic Trash. You can follow any responses to this entry through the RSS 2.0 feed. You can leave a response, or trackback from your own site.